This is Ellie. 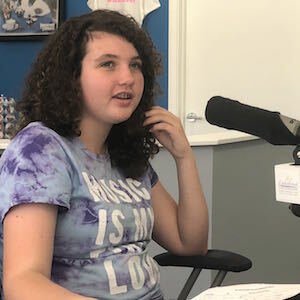 She’s got her very own 3-hour radio program, where she’ll share her passion for books and writing and her struggle with bullying. Ellie is one of Jennifer Smart Foundation’s Find Your Voice teens. She participated in a 3-hour group workshop and her own individual recording session, both held at the Find Your Voice center, located in the Outlets at Lake Elsinore. 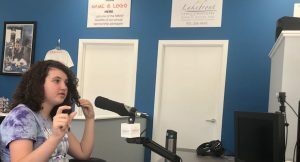 If you’re located in Lake Elsinore, Wildomar, Menifee or Canyon Lake, you can tune in to 101.7 FM, or you can listen to Ellie’s show from anywhere, online at JENNiRADIO.com and through the free JENNiRADIO iOS app. Click here to find out more about our Find Your Voice program. Copyright © 2019 · Jennifer Smart Foundation. All rights reserved.